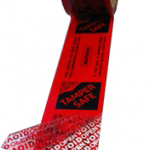 Stop pilfering with our fantastic range TAMPERSAFE Tamper Evident Tapes. Tamper Evident / Proof Security Tape is a special Packaging or Parcel Tape that leaves a warning message at any attempt to remove it. We can custom print and more, we manufacture, buy direct. We will beat any UK price! Available in Red or Blue from stock. Call 01268 768 768 for more info or to beat another price. We also stock Tamper Evident Security Labels. Theft of goods during transit in the UK has increased causing millions of pounds of loss to companies across the UK and in fact worldwide, but you can make it much harder for thieves by simply using our Security Void Tape which is proven to stop 99% of tampering before it even happens. Is it time you tried TAMPERSAFE?